Introducing the new range of Sky-Deck (tm symbol) equipped caravans. Luxury appointments, quality fittings and appliances, Norwegian recliners, breathtaking styling and that's only the interior. Outside the double glazed Euro-styled windows with black frames and trimmings give this range a truly refined finish. All of these, while amazing, pale against the focal point - your own private folding verandah - The Sky-Deck. Enjoy a quiet morning cup of coffee, cheese and crackers, a bottle of your favourite wine or maybe just quiet time with your dog. 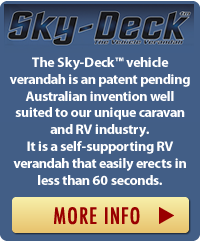 "Make your next van a verandah van, make it a Sky-Deck van"
The Sky-Deck is wholly Ausralian developed and made using the best components sourced from som eof the largest names in the yachting, body making and RV industries. For full specifications download the Sky-Deck brochure below.